TORONTO, ONTARIO, CANADA, April 15, 2019 /EINPresswire.com/ -- Survey by WHO World Mental Health (WMH) (https://www.ncbi.nlm.nih.gov/pmc/articles/PMC5632781/ ) shows that more than 70% of people are exposed to trauma; if left untreated, PTSD may lead to depression, addiction and suicide. Effective treatment PTSD presents perhaps the most pressing challenge in the field of mental health. 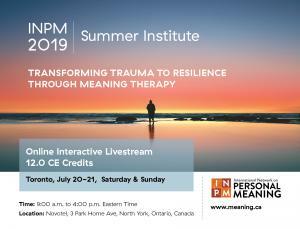 In his Meaning Therapy Workshop in Toronto, Paul Wong presents new development in meaning-focused therapy to transform trauma into strength. Wong’s known as the foremost authority of suffering by virtue of his 5 decades of meaning-focused research and practice. "Research in existential positive psychology leads to exciting new ways of preventing and treating PTSD. Wong advocates the radical acceptance of personal responsibility to face suffering. “Life is suffering, and trauma is often inevitable. Paradoxically, research has shown if we embrace the terrors of living with courage, we will experience less pain and anxiety. This defiant attitude functions like stress inoculation,” claimed Wong. His other innovative interventions include the dialectical approach to achieve a balance between opposites, and the double-vision strategy of keep an eye on the present situation and another eye on the life goal or the big picture. In his recent book on Inspirations for Difficult Times, he outlined many of the basic steps to return to the core values of faith, love and meaning, the positive triad which has powered human beings to survive and flourish since antiquity in spite of adversities.